Accepted for publication 10 March 2003. Published 18 April 2003. Del Ponte, E. M., Shah, D. A., and Bergstrom, G. C. 2003. Spatial patterns of Fusarium head blight in New York wheat fields suggest role of airborne inoculum. Online. Plant Health Progress doi:10.1094/PHP-2003-0418-01-RS. The spatial pattern of Fusarium head blight (FHB) incidence was studied in 70 winter wheat fields in New York over a period of 3 years. Incidence of FHB was randomly distributed among 60 sampling areas in 64 of the 70 fields. Fields with random FHB ranged from 0.05 to 23% in average incidence of FHB and followed bean, cabbage, corn, oat, pea, sorghum, and soybean. There was strong evidence of aggregation in FHB only in three fields that had large concentrations of corn debris. Many fields had small, scattered fragments of corn debris in evidence from a corn crop two or more years prior to wheat. The lack of aggregation in FHB and low incidences of FHB in these fields suggests that weathered corn debris contributed relatively little within-field inoculum for FHB. Based on the predominantly random patterns of FHB, disease in rotational wheat fields of New York appears to be initiated primarily by deposition of spores from diffuse atmospheric populations of G. zeae. We hypothesize that these airborne spores may originate largely from inoculum sources external to wheat fields. Over-wintered corn residue, especially from the preceding crop season, on the soil surface is the most likely potential source of regional atmospheric inoculum for FHB in New York. Fusarium head blight (FHB) of wheat (Triticum aestivum L.), caused mainly by the fungus Gibberella zeae (Schwein.) Petch. (anamorph Fusarium graminearum Schwabe), is a disease of increasing concern to wheat production (12). Economic losses result from decreased grain yield and decreased quality due to contamination of the grain by the mycotoxin, deoxynivalenol (DON). Contamination with DON can result in rejection of sale or severe price dockage by millers and other grain buyers. Fusarium head blight is a major economic constraint in New York where soft winter wheat for pastry flour is grown in rotation with vegetables and other field crops. Gibberella zeae survives between crop seasons as a saprophyte in debris of infected cereals and grasses, including corn and wheat (2). Ascospores and macroconidia of the pathogen are produced on over-wintered residues (7), and either propagule may infect wheat spikelets under moist conditions anytime from anthesis to kernel soft dough stages (13). The fungus initially invades individual spikelets and then spreads systemically through the rachis. Symptoms appear 5 days to 3 weeks after infection, manifested by the premature senescence (bleaching) of infected spikelets or portions of spikes (Fig. 1) and, under humid conditions, by the production of pink colored masses of spores (Fig. 2). Fig. 1. Symptoms of Fusarium head blight on wheat spikes. Fig. 2. Pink color on wheat spike due to spore masses of Fusarium graminearum. Ascospores and macroconidia may originate from over-wintered, infected debris or from infected, live hosts within or outside of wheat fields. The relative contributions of external and within-field inoculum sources to FHB is unknown, and may be expected to vary with production region, season, and agronomic practice. The question has particular relevance to the management of FHB in rotational cropping systems in which wheat does not directly follow corn, wheat, or barley. Steep gradients of FHB and G. zeae ascospores have been observed at horizontal distances from small area sources of inoculum (1,4). Gradients become shallower as the source area becomes larger (1,16). These observations are consistent with a theoretical model described by Ferrandino (5), which demonstrates that the shape of disease (or spore dispersal) gradients depends on the size of the inoculum source. Steep gradients are associated with sources of small area, and become flatter as the area of the source increases. Empirically observed FHB gradients and Ferrandino’s model suggest limited-distance spore dispersal (within cm) from small pieces of Fusarium-infected debris (such as corn residue) within a field. On the other hand, spores are also uplifted by turbulent air and potentially may be transported and deposited considerable distances from their origin. Francl et al. (6) recovered viable airborne spores on the roofs of buildings at km distances from agricultural fields, suggesting the possibility of long-distance dispersal. Viable propagules (predominantly ascospores, but also macroconidia) of G. zeae are commonly found in the planetary boundary layer of the lower atmosphere during wheat flowering in New York and are subject to gravitational settling or rain deposition (11; Schmale, Shields, and Bergstrom, unpublished). Spatial pattern analysis is a useful tool for gaining insights on the nature of inoculum sources (10). We assessed the spatial patterns of FHB in 70 New York wheat fields over 3 years in order to develop hypotheses about the origin of spores that caused primary infection of wheat spikes. We assumed that a predominantly random pattern of disease incidence would suggest deposition of spores from a diffuse, well-mixed aerial population, whereas a predominantly aggregated pattern of disease incidence would suggest deposition of spores from localized concentrations of inoculum. Spatial pattern analyses were considered along with information on the visual presence/absence of corn debris in wheat fields to make inferences about the source of spores for FHB. We assessed the spatial pattern of FHB incidence during late June (approximately kernel soft dough stage) in 70 arbitrarily selected winter wheat fields in central and western New York over a period of 3 years. The fields varied in wheat cultivar and crop sequence. In each field, the incidence of wheat spikes with symptoms of FHB was assessed in a total of 60 1-ft2 quadrats (i.e., N = 60 per field). Sampling was done in a portion of each field that appeared uniform in plant density and canopy height. Quadrats were placed while walking through six planting rows with 10 quadrats per row spaced at least 5 m apart; each chosen row was also spaced at least 5 m from the previous row. A 1-ft2 plastic quadrat frame was held level with the shortest spikes and all spikes within the frame were counted. Spikes were scored as diseased if even a single spikelet showed characteristic symptoms of FHB. We surveyed four fields in 2000 and six in 2001 for which we received information from growers on the previous two years’ crops. In 2002, the survey was expanded to 60 fields that more thoroughly represented the diversity of wheat cropping in western and central New York. In 2002, the presence or absence of visible corn residue on the ground within each quadrat was also recorded. Only one year’s previous crop data were available for these fields. where s2 is the sample variance and vbin is the expected (binomial) variance if the incidence of FHB is completely at random. If the pattern of FHB is completely random, then D = 1. A value of D > 1 is indicative of aggregation. One can test statistically whether D is significantly greater than one, because (N - 1)D has a chi-square distribution with N - 1 degrees of freedom (14). We considered FHB incidence to be aggregated in fields if D > 1 at a significance level of P < 0.05.
where is the probability of a spike exhibiting symptoms of FHB, m is the intercept, and is a categorical variable representing whether or not corn residue was observed in a quadrat. In the second approach, each of the 60 fields was classified as having corn residue or not. Data were then analyzed to determine whether the incidence of FHB in fields with corn residue was higher than in fields without. The model is the same as in (2), except that now represents whether or not corn residue was observed within the field. where m is the intercept, qi(j) is a fixed effect parameter representing whether or not corn residue was observed in quadrat i within field j, and fj is a parameter for random effects associated with field j. We also accounted for the possibility that the incidence of FHB in quadrats within the same field was more likely to be similar than incidence in quadrats from different fields by specifying the appropriate covariance structure in the SAS code (17). Average incidences of FHB observed in 2000 and 2001 ranged from 0.9 to 23.8% (Table 1). In all but one field, the pattern of FHB was random. In 2002, average incidences of FHB ranged from 0.05 to 27.1%, with 75% of sampled fields having an average incidence of FHB below 5% (Fig. 3, Table 2). In western NY, FHB incidence was generally low. Higher incidences were found in certain fields in Tompkins and Seneca Counties in central NY (Fig. 3). Of 60 fields, only five showed evidence (D > 1 and P < 0.05) of aggregation in FHB incidence (Table 2). Four fields in 2002 had been sown immediately following corn. Of those four fields, the two in Tompkins County (Fields 59 and 60 in Table 2) had been sown into standing corn residue without tillage. The incidence of FHB was highest in these two fields and they also showed the strongest evidence (D > 1 and P < 0.01) for aggregation of FHB. Mean incidence of FHB was not significantly different (P = 0.62) between fields with and without corn residue, or between quadrats with or without corn residue (P = 0.29). There was no evidence of aggregation of FHB in the eight fields in 2002 that had between 10 to 57 quadrats with corn residue; also there was no difference (P > 0.1) in the mean incidence of FHB between quadrats with and without corn residue in those fields. A random spatial pattern of FHB incidence was predominant in all crop sequences examined over the 3 years (Table 3). Table 1. Incidence and spatial pattern of Fusarium head blight (FHB) in 10 New York winter wheat fields in 2000 and 2001.
a Year - 1 is one year previous to the year of wheat harvest. Year - 2 is two years previous to the year of wheat harvest. 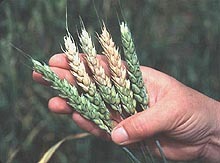 b The percentage of wheat heads showing symptoms of Fusarium head blight. c The spatial pattern of FHB-affected spikes was classified as aggregated if D > 1 and P < 0.05 (10). Fig. 3. Location, cultivar, and average incidence of Fusarium head blight (FHB) of winter wheat fields in western and central New York in which spatial pattern of FHB was assessed in June 2002. Table 2. Incidence and spatial pattern of Fusarium head blight (FHB) in fields of winter wheat in New York, 2002.
b The spatial pattern of FHB-affected spikes was classified as aggregated if D > 1 and P < 0.05 (10). Table 3. Spatial patterns of Fusarium Head Blight (FHB) incidence in 70 New York winter wheat fields with different cropping histories, 2000 to 2002. This is the first report of a wide-scale survey looking at the spatial patterns of FHB in a large number of fields across a wheat production region. Soft winter wheat is typically produced as a rotational crop on vegetable, cash grain, and dairy farms in New York and is usually planted following harvest of crops that are not considered primary inoculum sources of G. zeae. In this rotational cropping environment, we found that the patterns of FHB were predominantly random, suggesting that FHB was initiated primarily by deposition of spores from diffuse atmospheric inoculum. In theory, well-mixed aerial populations of spores could originate from sources within and/or outside of a wheat field. However, the random distribution of FHB in fields planted after vegetable crops or soybean, with little or no evident cereal debris, leads us to hypothesize that spores immigrant to wheat fields are important contributors to FHB in New York. A majority of the 70 fields in our survey exhibited low average incidences of FHB and only five fields had an incidence greater than 20%. Three of these high incidence fields showed aggregated patterns of FHB. El-Allaf et al. (3) reported that spatial patterns of FHB became more aggregated as average incidence increased in Ohio wheat fields. It would be instructive to assess spatial patterns in more fields that exhibit moderate to high incidences of FHB and that lack in-field sources of infected cereal debris, and to make assessments at multiple times during disease development. The localized presence of cereal residues infected by G. zeae has been shown to contribute to FHB in wheat fields (2). We found an aggregated pattern of FHB in a small minority of fields, indicative of G. zeae inoculum deposited on wheat spikes from concentrations of spores produced in localized patches within a field with little atmospheric mixing. There was only weak evidence for aggregation among quadrats in three fields that followed bean, oat, and pea, each of which had low or no incidence of corn debris; FHB incidence was low in these fields. There was strong evidence of aggregation among quadrats only in the three wheat fields in our survey that had large concentrations of corn debris in evidence; FHB incidence was high in these fields. This suggests that within-field corn residue was a contributing source of spores of G. zeae in these fields. Similarly, four Ohio wheat fields with corn stubble showed aggregated patterns of FHB (3). If more New York wheat producers were to plant their wheat crops directly into grain corn stubble, they could realistically expect an increased risk of FHB epidemics. While it is atypical in current New York crop rotations to plant wheat directly into wheat, barley, or corn stubble, small fragments of weathered corn stalks from corn crops two or more years prior to wheat planting are commonly seen in New York wheat fields, including some in our survey. We sampled fields with no corn residue that averaged over 20% incidence of FHB, as well as fields with weathered corn residue in every sampled quadrat that had average FHB incidence below 5%. Even when old corn residue was present in fields, the lack of aggregation in FHB and low incidences suggested that within-field sources of G. zeae spores were not strong contributors to FHB. This was backed up by statistical analyses which showed no significant difference in the incidence of FHB among quadrats with corn residue compared to quadrats without. This suggests that the small bits of old corn tissues we found in rotational wheat fields contributed relatively little to FHB compared to airborne spores coming from outside of those fields. The most likely potential source of regional atmospheric spore populations in western New York in late May/early June (when winter wheat flowers) is over-wintered corn residues still remaining on large acreages following grain harvest in the previous fall. Khonga and Sutton (7) documented significant ascospore production from infected corn stubble for two seasons following corn harvest in Ontario, a cropping environment very similar to that of western New York. Viable spores of G. zeae are commonly present in the planetary boundary layer of the lower atmosphere, detected at up to 600 ft above ground, during wheat flowering in New York (11; Schmale, Shields, and Bergstrom, unpublished). The contribution of atmospheric populations of G. zeae to infection of wheat spikes in rotational cropping systems is the subject of on-going research (15). This research was supported by Cornell University Hatch Project NYC153472 and by a fellowship from CNPq - Brazil, that allowed Emerson Del Ponte, a graduate student at the Federal University of Pelotas (Brazil), to conduct research at Cornell University. We gratefully acknowledge Alan Westra of the New York Seed Improvement Project, who coordinated grower contacts as well as provided crop production information and transportation; John Cianchetti, Stan Kawamoto, and Christine Stockwell, who helped with data collection; and the many New York producers who allowed us to walk through their wheat fields. 1. de Luna, L., Bujold, I., Carisse, O., Paulitz, T. C. 2002. Ascospore gradients of Gibberella zeae from overwintered inoculum in wheat fields. Can. J. Plant Pathol. 24:457-464. 2. Dill-Macky, R., and Jones, R. K. 2000. The effect of previous crop residues and tillage on Fusarium head blight of wheat. Plant Dis. 84:71-76. 3. El-Allaf, S. M., Madden, L. V., and Lipps, P. E. 2001. Spatial pattern of scab incidence during Fusarium head blight epidemics on winter wheat in Ohio. Pages 18-22 in: Proc. 2001 National Fusarium Head Blight Forum, Erlanger, KY. 8-10 Dec. 2001. 4. Fernando, W. G. D., Paulitz, T. C., Seaman, W. L., Dutilleul, P., and Miller, J. D. 1997. Head blight gradients caused by Gibberella zeae from area sources of inoculum in wheat field plots. Phytopathology 87:414-421. 5. Ferrandino, F. J. 1996. Length scale of disease spread: Fact or artifact of experimental geometry. Phytopathology 86:806-811. 6. Francl, L., Shaner, G., Bergstrom, G., Gilbert, J., Pederson, W., Dill-Macky, R., Sweet, L., Corwin, B., Jin, Y., Gallenberg, D., and Wiersma, J. 1999. Daily inoculum levels of Gibberella zeae on wheat spikes. Plant Dis. 83:662-666. 7. Khonga, E. B., and Sutton, J. C. 1988. Inoculum production and survival of Gibberella zeae in maize and wheat residues. Can. J. Plant Pathol. 10:232-239. 8. Littell, R. C., Milliken, G. A., Stroup, W. W., and Wolfinger, R. D. 1996. SAS® System for Mixed Models. SAS Institute. Cary, NC. 9. Madden, L. V., and Hughes, G. 1994. BBD - Computer software for fitting the beta-binomial distribution to disease incidence data. Plant Dis. 78:536-540. 10. Madden, L. V., and Hughes, G. 1995. Plant disease incidence: distributions, heterogeneity, and temporal analysis. Annu. Rev. Phytopathol. 33:529-564. 11. Maldonado-Ramirez, S. L. 2001. Aerobiology of the wheat scab fungus, Gibberella zeae: Discharge, atmospheric dispersal, and deposition of ascospores. Ph.D. Thesis, Cornell University, Ithaca, NY. 12. McMullen, M., Jones, R., and Gallenberg, D. 1997. Scab of wheat and barley: A re-emerging disease of devastating impact. Plant Dis. 81:1340-1348. 13. Paulitz, T. C. 1999. Fusarium head blight: A re-emerging disease. Phytoprotection 80:127-133. 14. Pielou, E. C. 1977. Mathematical Ecology. Wiley, NY. 15. Schmale, D. G., Shields, E. J., Bergstrom, G. C. 2002. Airborne populations of Gibberella zeae: spatial and temporal dynamics of spore deposition in a localized Fusarium head blight epidemic. Page 178 in: Proc. 2002 National Fusarium Head Blight Forum, Erlanger, KY. 7-9 Dec. 2002. 16. Stack, R. W. 1997. Gradients of Fusarium head blight in wheat along transects away from a concentrated source of Gibberella zeae ascospore inoculum. Page 60 in: Proc.1997 National Fusarium Head Blight Forum. St. Paul, MN. 10-12 Nov. 1997. 17. Wolfinger, R. D. 1996. Heterogenous variance-covariance structures for repeated measures. J. Agric. Biol. Environ. Stat. 1:205-230.